Fortnite Season 7 Week 10 challenges are finally out, once again gear up your load-outs and jump into the open area of new Fortnite Challenges to earn lucrative Battle Stars. There are in total seven challenges among which three are free to play and are limited to exclusive buyers of Season 7 Battle Pass. How To Complete: Locate Mounted Turret or Damaged Trap and place it. Repeat this in three different matches to complete the challenge. 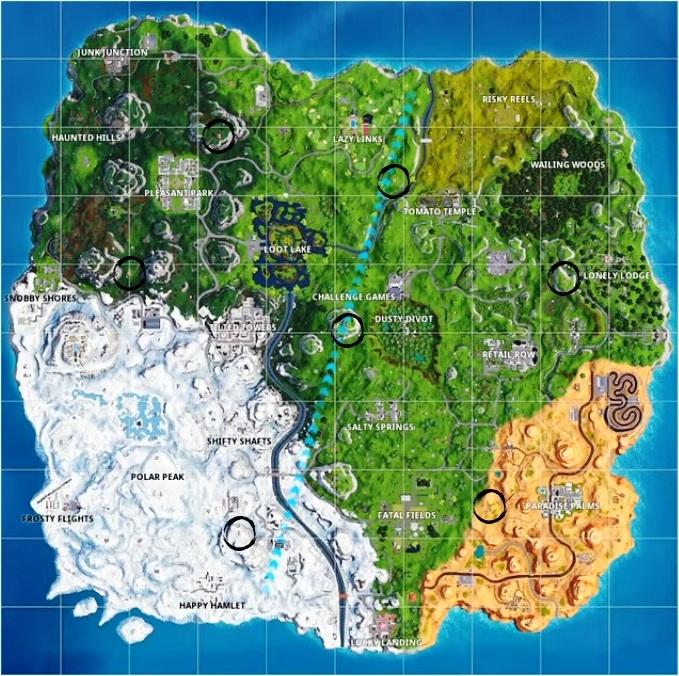 How To Complete: Find and open seven chests in Lazy Link or Dusty Divot, you can either find the entire seven chests in one single location or scan both the areas for completing the challenge fast. How To Complete: Kill three opponents using an Assault Rifle. It is not necessary to do it one shot, you can take your time. How To Complete: Use Scoped Weapons to cause 200 Damage in total, the first objective must find a scoped weapon. How To Complete: This one has three stages, the first is one above, second is get a score of 5 or more at shooting gallery north of Retail Row and get similar 5 or higher score at the same place in Paradise Palms. How To Complete: This is a hard one, you have to visit four different Outpost to complete the challenge. So plan your route properly. Use the image above to plan your journey. How To Complete: Attack three opponents with Chiller Grenade or Boogie Bomb in different matches. There can be possibly some changes to compete in the challenges, but you know now enough. So complete all the challenges and earn your reward in the end.